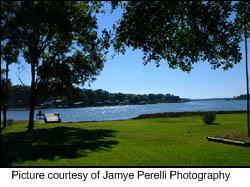 The fourth largest lake in Texas, Cedar Creek Lake is 32,623 acres, 18 miles long and offers 320 miles of shoreline. The widest point of the lake is 8.5 miles and the deepest is 53 feet. Cedar Creek Lake is located 55 miles southeast of Dallas, Texas so the short commute to is a big benefit to "weekenders" or permanent residents that commute to DFW. Cedar Creek Lake was created in 1964 as a water reservoir for Tarrant County and is one of the very few lakes in Northeast Texas that allows property ownership of the waterfront with the ability to have your own private boathouse. Cedar Creek Lake has also been recognized as one of the best places in the country to live for retirement. Towns on or near Cedar Creek Lake include Kemp, Mabank, Gun Barrel City, Payne Springs, Enchanted Oaks, Eustace, Caney City, Malakoff, Star Harbor, Trinidad, Tool and Seven Points. 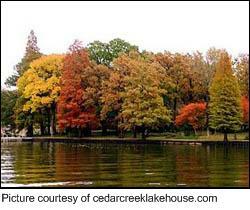 Cedar Creek Lake was built on Cedar Creek, a tributary to the Trinity River. The dam is located in the Malakoff at the south end of the lake. The spillway lets water into a canal to the Trinity River located on the west side of the lake. Other major creeks that contribute to the inflow are Caney Creek, Clear Creek, and King's Creek. Blue catfish, Channel catfish, Flathead catfish, Largemouth bass, White bass, Hybrid striped bass, and Crappie are the predominant fish species of Cedar Creek Lake. The southern portion of the lake, where the water is clearer is the best fishing areas for Largemouth bass. Catfish are found everywhere, with more Blues than Channels. Fishing is particularly good in the spring and into summer. Running jug lines in the channels of the many coves using goldfish, shad, and small perch, make very good Blue catfish, and Flathead (Yellow) catfish fishing grounds due to the many smaller streams, creeks, and run-offs flowing into the lake. As you can see, Cedar Creek Lake is an excellent vacation destination or year-round lake home. Designed by Business In The Black.